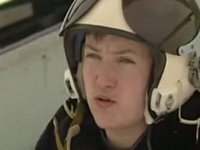 Ukrainian parliamentarian and pilot Nadia Savchenko arrested by Russia has asked the International Committee of the Red Cross (ICRC) to favor her returning to the motherland. Besides, her lawyers insist that the Russian Federation Investigative Committee suspend the criminal proceedings against her as the prisoner of war. "We appeal to the Investigative Committee to suspend the criminal proceedings against Savchenko because of her status of prisoner of war," Savchenko's lawyer Mark Feygin wrote on Twitter. The defenders refer to articles 4 and 5 of the Geneva Convention. The lawyers are going to appeal to the International Committee of the Red Cross, the Ministry of Foreign Affairs of the Russian Federation and the United Nations in the coming days on the implementation of the obligations of the Geneva Conventions with regard to Savchenko. In addition, the defense intends to ask the Federal Penitentiary Service of Russia for permission of the defendant to be examined by an otolaryngologist. Feygin said that Savchenko is thinking about beginning of a hunger strike in case of ignoring of her rights as the prisoner of war. As previously reported, Savchenko's lawyers declared significant deterioration of her health.